Fort Myers is located on the southwest region of Florida, directly on the Gulf of Mexico. Thousands of tourists flock to the city each year to experience the serenity of the ocean, as well as the abundant variety of shells that lie on its shores. Tourists can experience the natural beauty of Fort Myers by visiting its many nature preserves. Currently, Ft. Myers has a population of 77,146 residents and has a wide variety of neighborhoods, parks, and schools. Fort Myers offers an array of restaurants, coffee shops, and stores. Tourism in Fort Myers is largely seasonal, with an increase in visitors in the winter months. During this time, the roads are congested with both tourist and commuter traffic. Tourists that are unfamiliar with the roads in Fort Myers, as well as driver negligence and distractions, can cause car crashes that may lead to serious injury or even death. If you have been the victim of an automobile accident, contact the Fort Myers car crash lawyers at the Wolfson Law Firm. You may be concerned about paying for medical treatment or damages to your car. Perhaps you’ve been unable to work during your recovery time. We can answer these questions. If you or a loved one has suffered injuries or a fatality as the result of an automobile accident and would like to speak to our Fort Myers car crash attorneys, contact the Wolfson Law Firm at 239-777-9954 for a free consultation. Why Contact a Fort Myers Car Crash Lawyer? As an accident victim, you have rights. To find out what compensation you may be entitled to, contact the Wolfson Law Firm at 239-777-9954 for a free consultation. How do roadway hazards cause car crashes in Fort Myers? Driver negligence – Negligence is often seen when drivers travel at excessive speeds, disregard traffic signals and signs, or switch lanes without looking. Driver distraction – Drivers that divert their attention from operating their vehicles. The most commonly known distractions include the use of cell phones or texting while driving. Other distractions include eating while driving, talking with passengers, or daydreaming. Drivers who are unfamiliar with the roads may be distracted as they are looking at their navigational devices, maps, or just taking in the scenery while they are travelling. Debris – Objects lying in the road can be hit by motorists, potentially causing injury or damages. Common forms of debris include rocks, construction materials, and tree branches. In some cases, objects, such as boards or tools, can fly off of construction trucks or commercial vehicles, hitting the vehicle behind them. Construction zones – Large vehicles entering and leaving the roadway, as well as improper signage can cause hazardous conditions. When signs that notify drivers of an upcoming construction zone or a decrease in speed are missing, they can unknowingly hit construction trucks as they slow down to pull off the highway, or travel too fast through construction, which may result in an accident. Uneven roadways and parking lots – Potholes or manhole covers that are not even or flush with the roads create hazards for drivers in Fort Myers. Loose sand, gravel, or water – Driving over these hazards can cause cars to slide or slip and may result in the driver losing control, potentially sliding into another vehicle or object. Loose items on the road can become airborne when driven over, potentially hitting the vehicles behind them. Accidents may not always involve two drivers. 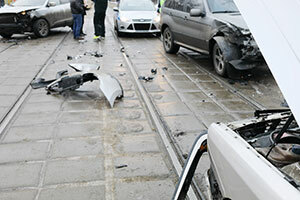 In some cases, roadway hazards may cause cars to slide into barriers or hit objects on the road. A car crash attorney can help to identify all parties responsible in an accident, to help you pursue the compensation that you need to pay for medical bills, recover lost wages, and repair damage to your property. The Wolfson Law Firm proudly serves residents in Fort Myers and the surrounding communities of Fort Myers Beach, North Fort Myers, South Fort Myers, Sanibel, Captiva, and Golden Gate. If you or your loved one has been the victim of a car accident, contact the Fort Myers car crash attorneys at the Wolfson Law Firm at 239-777-9954 for help.